It’s time for our annual holiday market, and this year it kicks off the first day of Winter Shares! The holiday market is a chance to showcase local vendors, while giving you an easy one-stop location for holiday shopping. 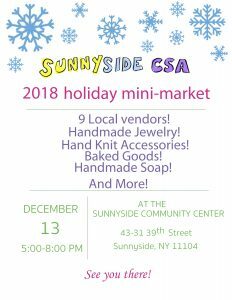 This year we’re featuring nine local vendors, including handmade accessories, soap, yummy treats and more. Come check it out December 13th from 5:00-8:00pm.